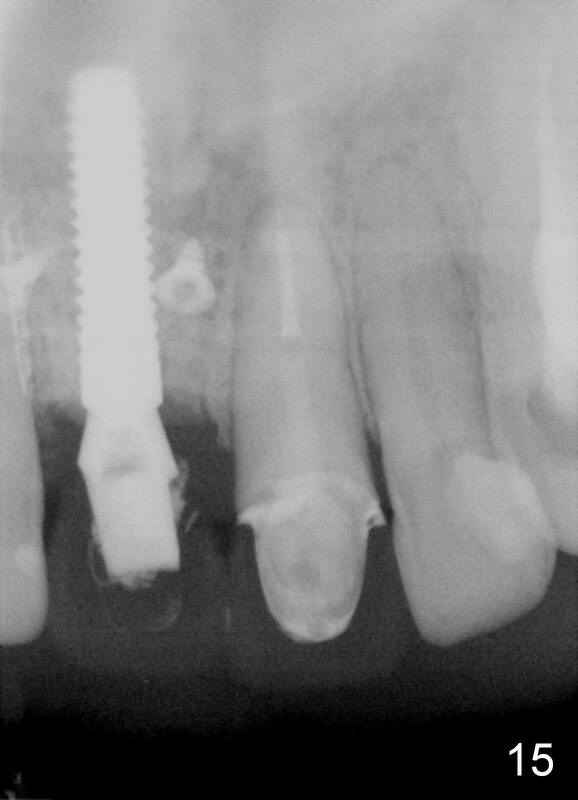 The patient returns for Zirconium abutment retrieval 1 month post its fracture. 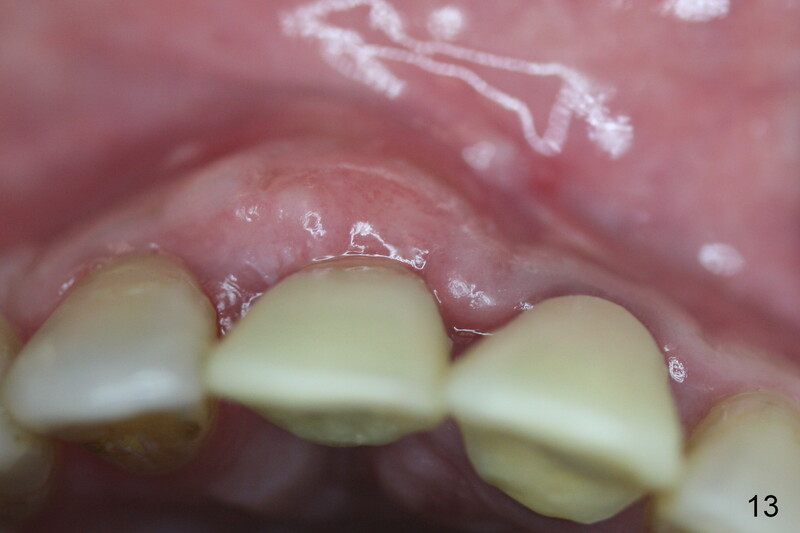 When the provisional is removed, the gingival pontic morphology remains (Fig.2). 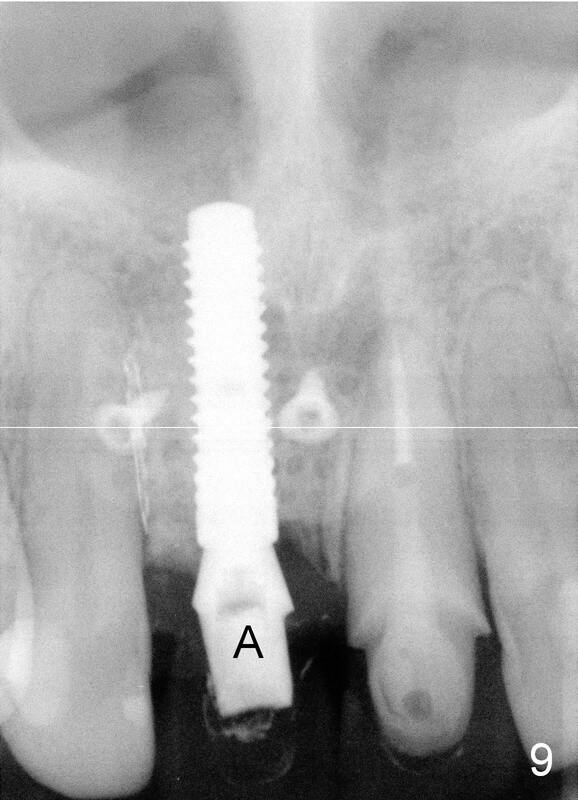 There is no problem to remove the abutment screw (Fig.1 with its driver), whereas it is difficult to remove the remaining abutment (Fig.2 *) due to limited access. 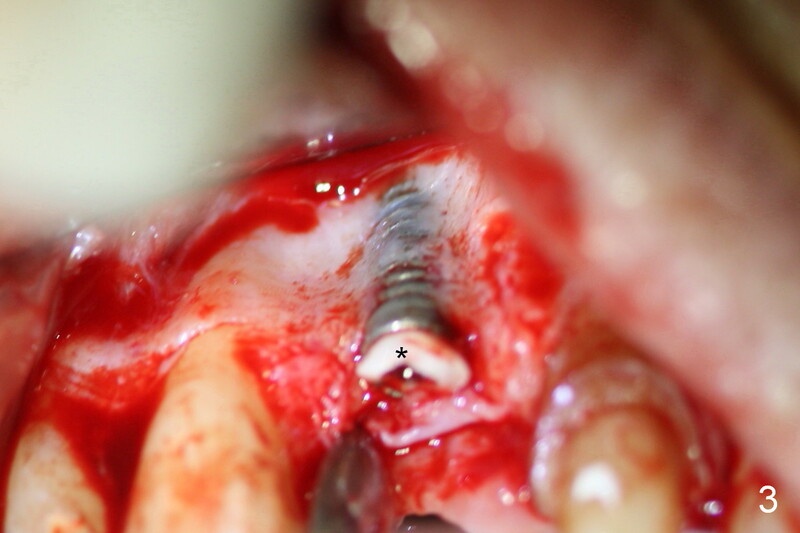 When the access improves by incision (Fig.3), buccal implant thread exposure is confirmed and the fractured abutment (*) is to be removed easily. 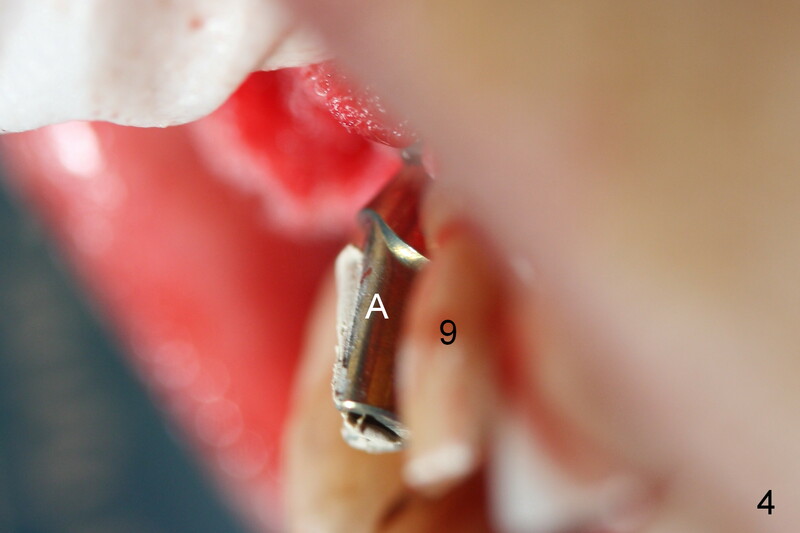 A 15° angled abutment (A) corrects the angulation, but not the position (Fig.4,5, compare to Fig.1 with a driver in place). 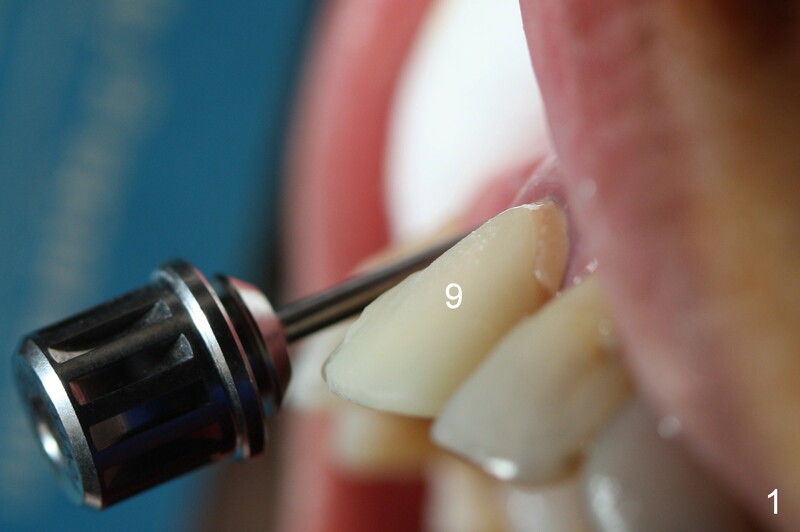 After being trimmed, the labial contour of the abutment is equivalent to that of #9 (Fig.6,7), but the margin is higher. 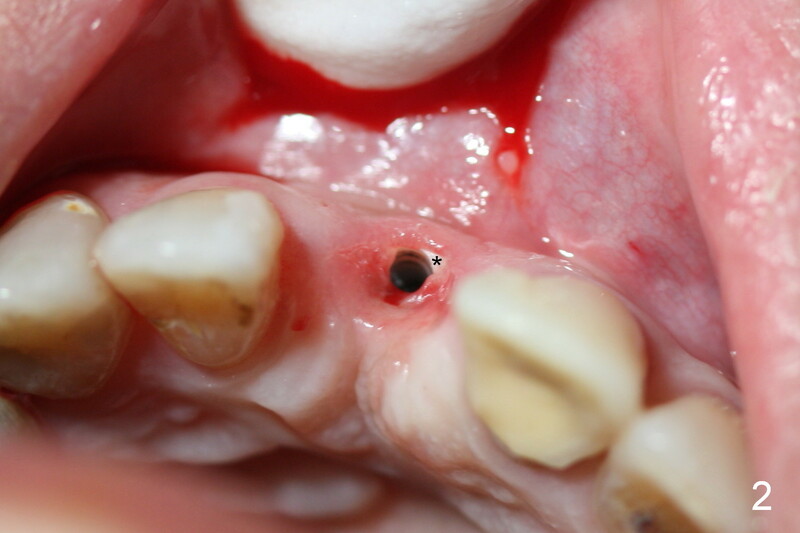 Using an abutment with taller gingival height (from 2 mm to 3 mm) may alleviate the margin issue. 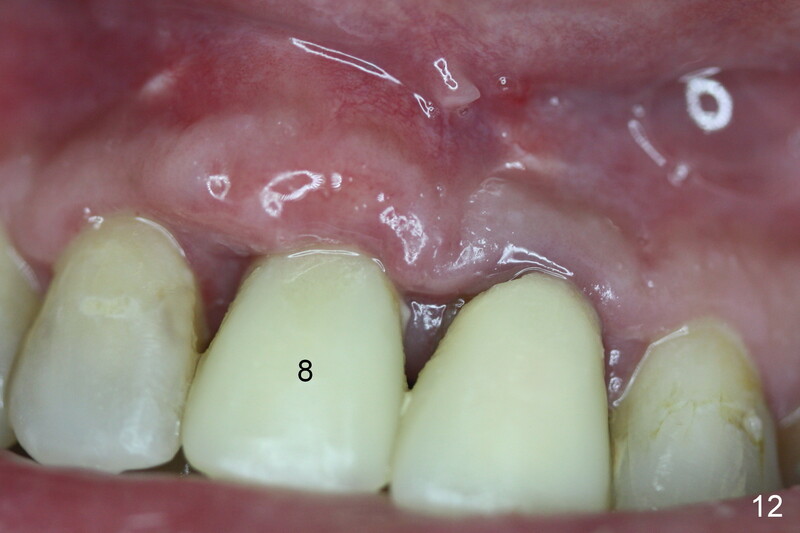 To correct the gingival margin associated with #8 implant, bone graft is needed. Particulate graft may not stay in place. Chin graft is harvested. 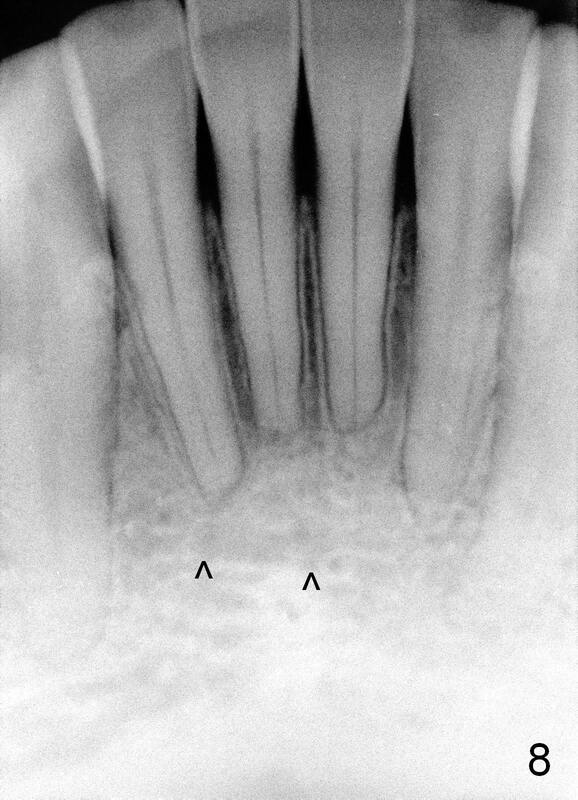 Since the roots of the lower anterior teeth are long (Fig.8), the width of the chin graft is limited for direct screw fixation (Fig.9,10). 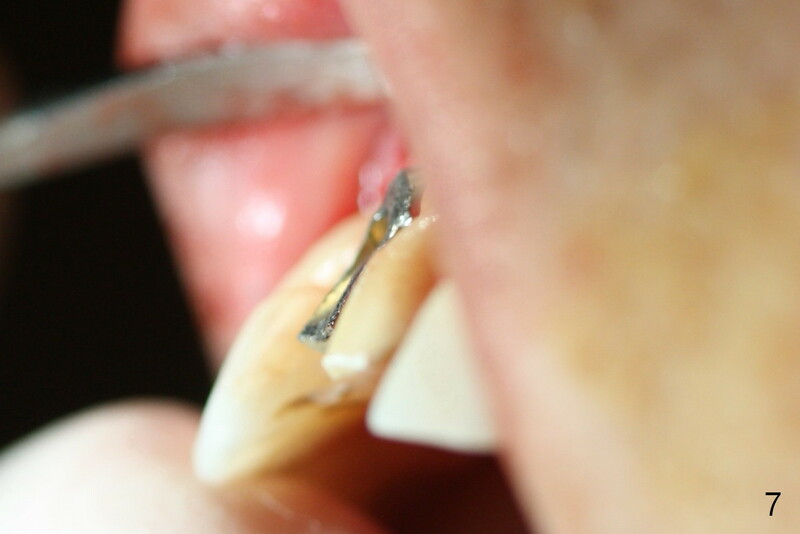 Titanium mesh is used for fixation of the graft. 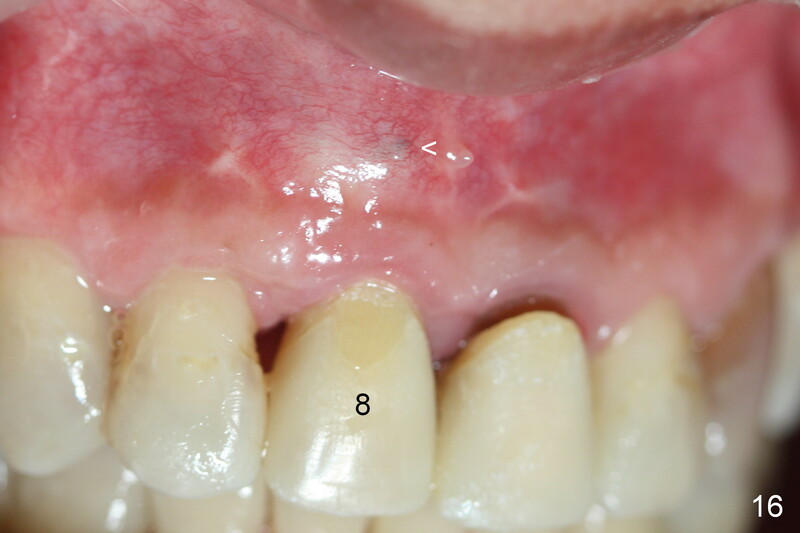 Connective tissue graft from the palate is to increase bulk at the site of #8 (Fig.11 *). There is no symptom or sign of infection 1 month postop (Fig.12,13). 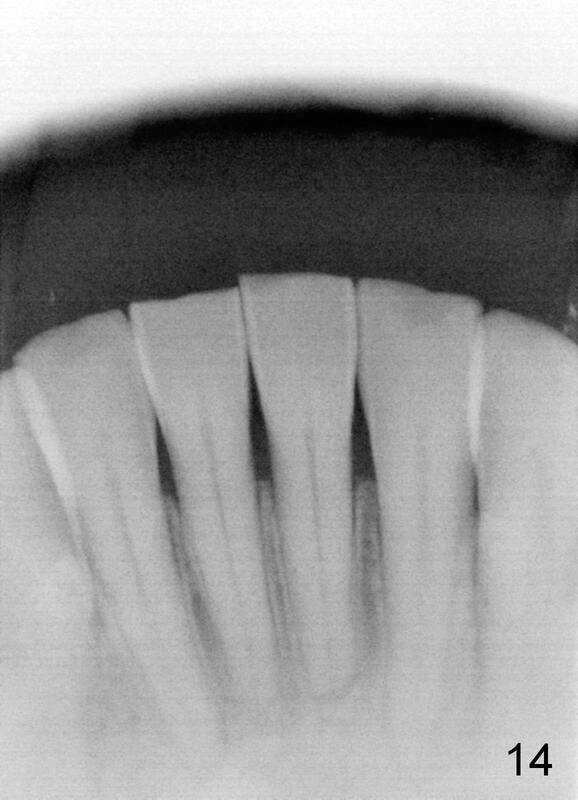 Although there is alteration of sensation of the lower incisors, there is no apical radiolucency of them 4 months postop (Fig14). 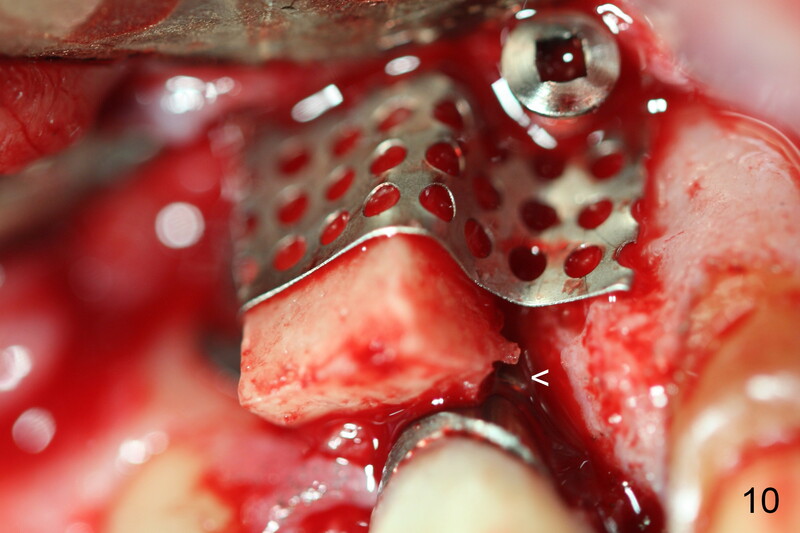 There is no abnormality associated with the bone graft and Titanium mesh (Fig.15). 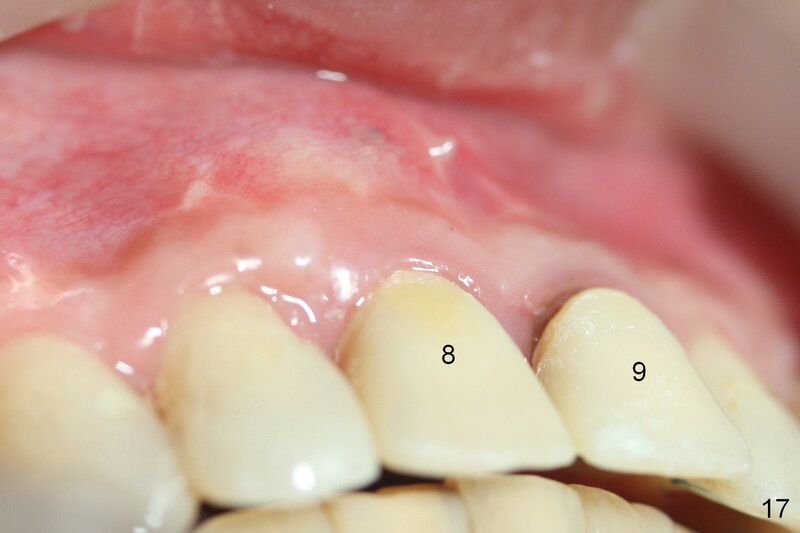 Nine months postop, the gingival margin is symmetrical over the provisional crowns at #8 and 9 (Fig.16). 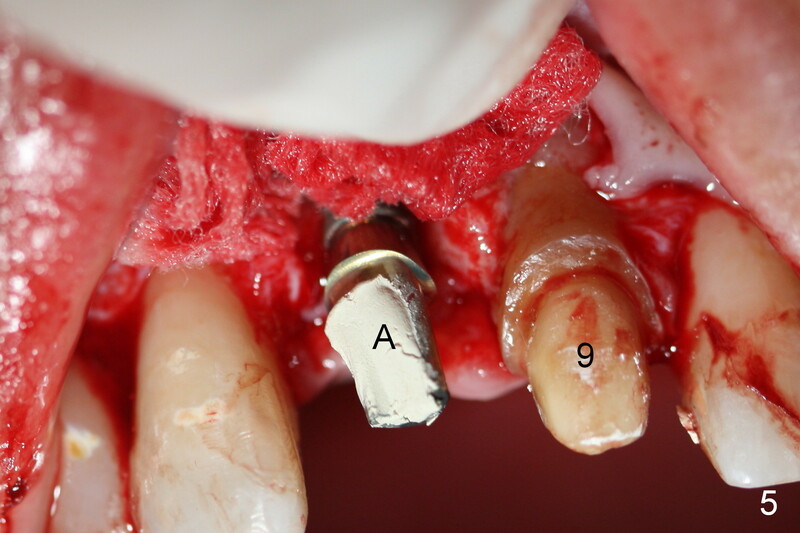 There is no bulging or concavity associated with the implant at #8 (Fig.17). Screw (Fig.16 <) removal is scheduled prior to final restoration. 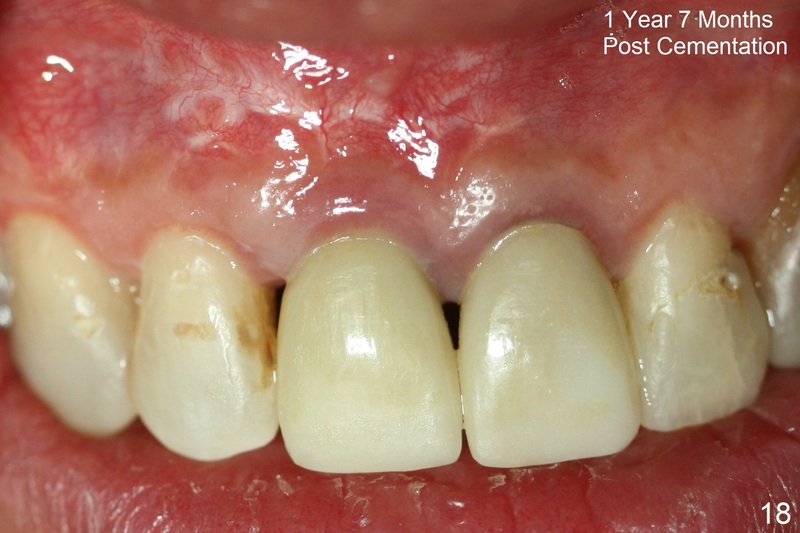 The gingiva is healthy 1 year 7 months post cementation (Fig.18). 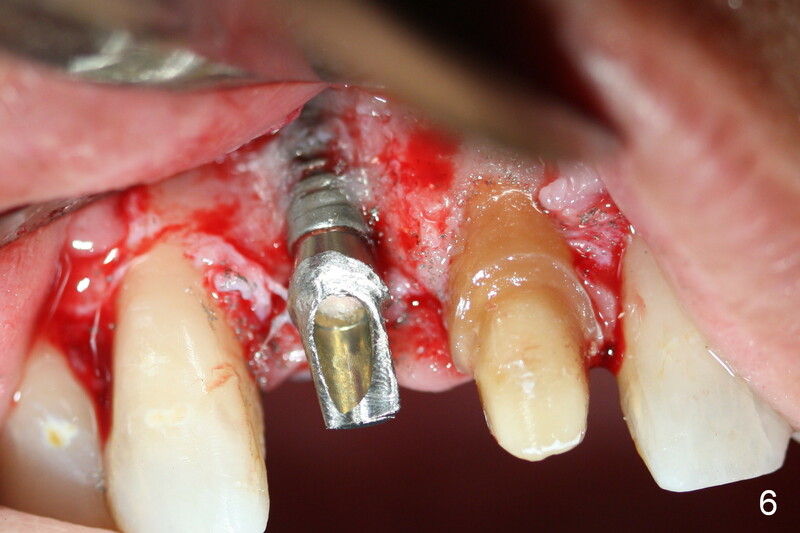 If segmental osteotomy is needed postop, how to do it?